anyone here moved the water pump located behind the galley fridge to the engine compartment ? Why ? What reasons ? Curious. Would that cause heated water ? You not planning on drinking that water?? We only use to wash and we turn that water over once or twice a week. The main reason is to be able to filter the water (coming from the tank/water pump) and from the city water line. 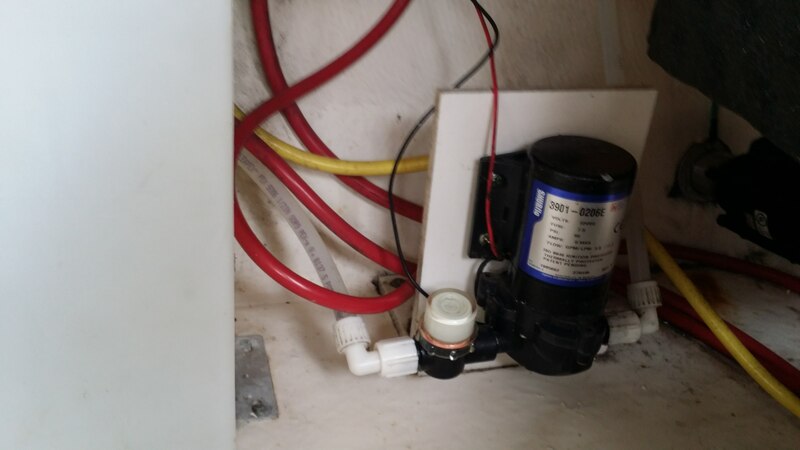 I am looking at adding this filter (http://www.safh2ouv.com/Boat---RV-Owners.html) - I have limited room behind the fridge so would like to move it to the engine compartment. Then why add the filtration system? There is no need for it, providing your getting clean water to begin with. Does it taste bad or hard water? Noise / banging could be pressure switch acting up or set wrong. A piston pump can bang a lot. Chech mounting bolts . Chech pressure switch ON & OFF settings. Use a none piston pump. Use right softness rubber bushings to secure the pump..
water from the marina smell yes and we are already using a RV filter cartridge directy at the post. Noise / banging could be pressure switch acting up or set wrong. A piston pump can bang a lot. Xhech mountin﻿g bolts . If you want to relocate it, it’s helpful to determine if your pump will work in the new location first. Suggest that you determine if it’s self priming or, if not, whether the new location is lower than the water source and always wet; whether the motor is rated for service in an engine compartment (flammable/explosive environment); and whether the unit has enough head and flow capacity to push the water wherever it has to go (head is vertical displacement; flow is GPM and pressure). In your documentation the pump manufacturer and model number should be identified. If not, it’s on the pump. Some internet research on the manufacturer’s site will answer these questions. Splicing water lines is easy. Good luck. If you want to relocate it, it’s helpful to determine if your pump will work in the new location first. Suggest that you﻿ determine if it’s self priming or, if not, whether the new location is lower than the water source and always wet; whether the motor is rated for service in an engine compartment (flammable/explosive environment); and whether the unit has enough head and flow capacity to push the water wherever it has to go (head is vertical displacement; flow is GPM and pressure). In your documentation the pump manufacturer and model number should be identified. If not, it’s on the pump. Some internet research on the manufacturer’s site will answer these questions. Splicing water lines is easy. Good luck. thank you Curt, makes total sense! Most of these pumps are noisy by nature, just FYI. What you're hearing could in fact be the normal sound the pump generates and there's actually nothing wrong with it. Keep that in mind. If you do relocate the tank and pump and add that filter, where would you place it? Do they suggest a specific in-line location? I'm guessing most likely post-pump since you'll want the water to be filtered after it passes the tank and pump. You'll also have to check and see if the current pump has the capacity to push through the filter, or get a more powerful pump. This is mine. Original pump from Chaparral and it makes a #&#036;%&#036;&amp;&#036;% racket. 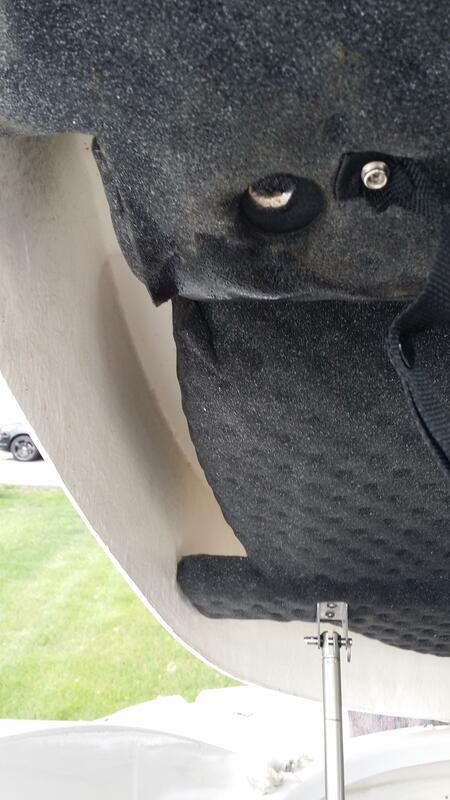 Always has since I bought the boat almost brand new and it's mounted well. Notice the little screen filter container is pre-pump. I did a web search of the Shurflo pumps. They all have that surging noise. Normal. The cure is your water flow is to SMALL. So the pump is surging. The best cur is to install a ACCUMULATOR tank pressurized to 30 PSI...…… That cured the surging banging. People said it ran quiet when the toilet was flushed !!!! High volume no surging noise. Simple. If interested I can get the site & post it. Notice the little screen filter container is pre-﻿pump. I think this is the same brand, but mine is on the wall behind the fridge. The cure is your water flow is to SMALL. So the pump is surging. The best cur is to install a ACCUMULATOR tank pressurized to 30 PSI...…… That cured the surging banging. People said it ran quiet when the toilet was flushed ﻿!!!! High volume no surging noise. Simple. If int﻿ereste﻿d I can get the site & post it. Do a direct web search of the address. That does work. Will review this, appreciate the information! Where is your water tank? 2013 Signature 330, right? Is the tank in the engine compartment? If you relocate the pump, you'll have a bit of re-piping to do to extend the lines. Ideally the pump should be next to the tank. And what is the main goal besides reducing the noise, more water capacity via being able to filter water from the lake? Maybe installing a grey water system would be a better alternative for you, if you're goal is not necessarily being able to drink it. A grey water system would help extend your current water capacity if I understand that's the way the system works. Where is your water tank? 2013 Signature 330, right? Is the tank in the engine compartment? If you relocate the pump, you'll have a bit of re-piping to do to extend the lines. Ideally the pump should be next t﻿o the tank. And what is the main goal b﻿esides reducing the noise, more water capacity via being able to filter water from the lake? Maybe installing a grey water system would be a better alternative for you, if you're goal is not necessarily being able to drink it. A grey water system would help extend your current water capacity if I understand that's the way the system works. I'm looking at the layout of a 2013 Sig 330 and the pump is actually located in the best spot possible IMO. If it's behind the fridge, that means it's right under the galley sink, yes? Then all the supply lines are relatively short runs. Galley sink, head (toilet, sink & shower) and even cockpit sink above deck. The only long run is to the transom shower. Personally, I would keep the pump where it is and if you install that filter, try to get it close to the pump if you have the room. Another way to reduce noise, assuming the other things that have been suggested are ruled out and we’re talking about the common “whirl”, get a length of insulation, sew it into a cylindrical shape and slide it over the pump. A pair of long wire ties to “grip/cinch” it in-place works well. Suggest a U.S. made marine or aerospace grade vinyl with an anti-fungal and flame retardant as the cover that the insulation is sewn into. A less expensive vinyl is one marketed for awning/tent use. Provided U.S. made, these should also have an anti-fungal and a flame retardant. Look for NFPA-701, E-84, etc. These are the common flame standards. A yard or so should do it. For about $20 to $30 you’ve accomplished less noise (again, assuming the other stuff is ruled out or corrected as needed). That's a good idea, Curt. In my situation, since I have the room to do it and if the noise was too bothersome to me, I would do the same thing but instead of a cylinder, I would just make a small box out of some lightweight material as a cover and line the inside of it with some type of insulation material like you suggested and place it over the pump and clip it with a couple of screws. That would probably muffle the sound considerably and at the same time, not suffocate the pump and plausibly cause it to overheat. The same foam insulation material Chaparral uses under the hatch would probably work well.